POLYply is a series of events foregrounding cross-genre writing, which includes poetry readings, performances, film screenings and installations. POLYply events are each organised around particular themes, presenting performances, readings, film screenings and installations by participants including poets, artists, musicians and architects. 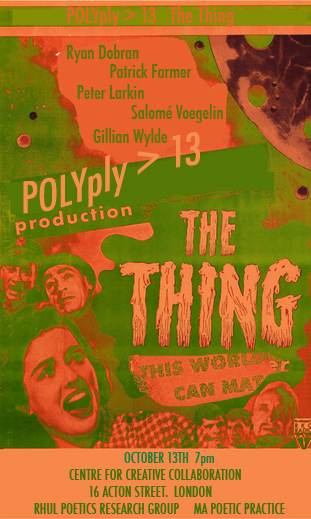 The aim of POLYply is to promote dialogue and discussion amongst creative practitioners writing in an expanded field by providing a space for the dissemination of new work within poetic practice. For POLYply 13 'The Thing', I presented video works and a lecture presentation.